Who is responsible for compensating me for my rebooked ticket to Istanbul? My return ticket(see attachment) booked through Expedia UK on a single itinerary was on two different airlines. 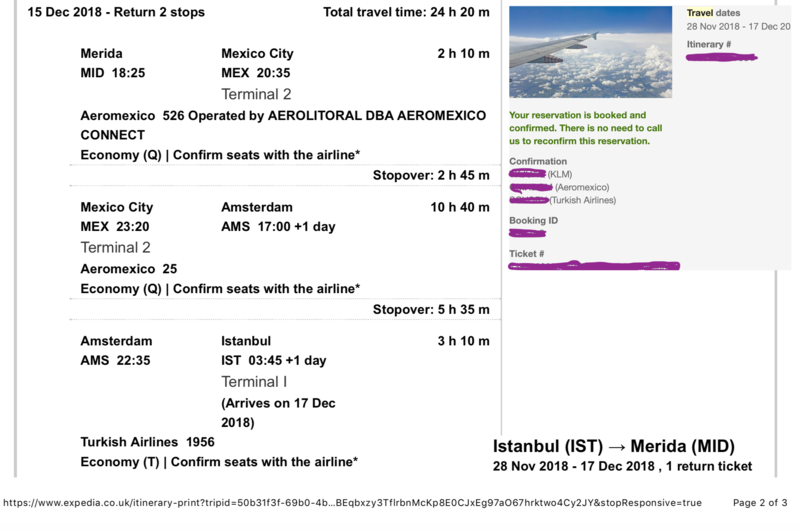 Aeromexico agent would not check my bag from Mexico through Amsterdam to my final destination...Istanbul, Turkey, on Turkish Airlines. He said they were not parter airlines. The flight was diverted and late arriving to Amsterdam and I had to pick up baggage to recheck on Turkish airlines (through passport control etc).Consequently, I missed my flight to Turkey and had to purchase an expensive ticket next day to get home. Expedia did not disclose on the ticket issues with two different airlines, but says Aeromexico is responsible. Aeromexico says they are not responsible to refund a flight on a different airline that it is Expedia UK's problem. Browse other questions tagged luggage international-travel or ask your own question.